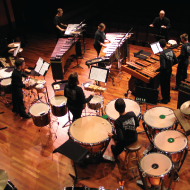 Orchestral Percussion is one the finest traditions in the world. Studying the art of Orchestral Percussion is the most demanding musical practice you can pursue and yet it is merely a personal. Playing Marching Snare can be the most challenging and rewarding musical experience in High School. The techniques you learn performing Marching Snare solo will serve you in every other percussive art. Students usually begin to work on their Marching Snare techniques in 7th grade and continue through High School. Many Colleges support marching band and hence their music department by offering scholarships to those who pass an audition. Thousands each year succeed in passing auditions and receive their scholarship because they worked on their Marching Snare techniques. Each of my students, given a disciplined practice, has an excellent chance to earn their own scholarships.